For the shooting of the independent feature "Blue Road" Director Oliver Cukor used 3 Panasonic Mini DV AGDVX100A cameras. 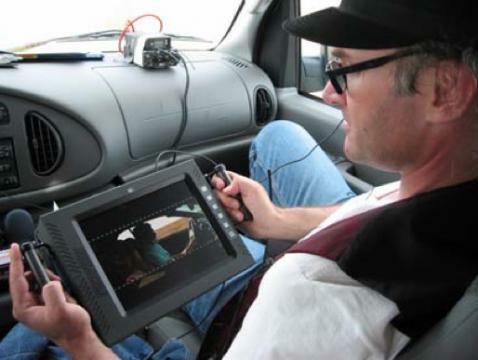 Because it is about a road trip, the film was mostly shot on remote locations with as many as 3 major locations per day. The schedule did not allow for long set-up time. All 3 cameras were equipped with Titan wireless transmitters. The 3 Titan receivers fed the signals to a Quad system that was in turn sent to a 4th Titan transmitter. The 4th Titan receiver was mounted on a 10.4" High Brightness Transvideo monitor. The Director could, with the flip of a switch, view all 3 cameras in a split screen, or each one of the 3 cameras independently in full screen. "My main concern was to have the freedom to shoot spontaneously. The Transvideo Titan system gave each camera the ability to move freely while I was able to watch each shot at the same time no matter where we were shooting. Even under the most demanding situations such as outside in the noon day sun without a hood, I was able to use the 10.4" Transvideo monitor for composing shots. It would have been impossible with a conventional CRT monitor in such bright conditions. I cannot imagine any other way I could have shot this feature film with 2 or 3 cameras shooting simultaneously, on the time frame, budget and crew size that the film could justify, and still achieve such a high quality result without using TransvideoTitan wireless system and 10.4" monitor". Photos courtesy of Blue Road Films Inc.
Baker, CA: Setting up two cameras under a sizzling 107o sun on the car hood. 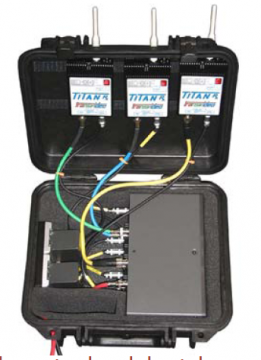 Two Titan transmitters send the images to the Director's 10.4" TRANSVIDEO monitor. 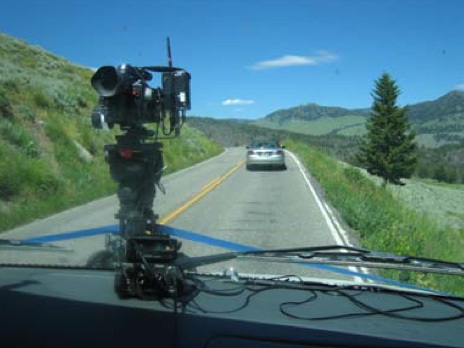 Yellowstone National Park: One camera set up on the hood, the Titan transmitter sends the image to the Director through the windshield. 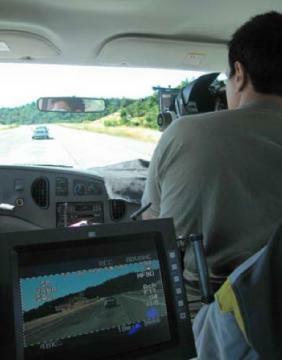 Oliver Cukor in the follow car monitoring the camera inside the actor's car, 5 to 10 car-lengths ahead. Oliver Cukor directing the shot from the back seat of the camera car. 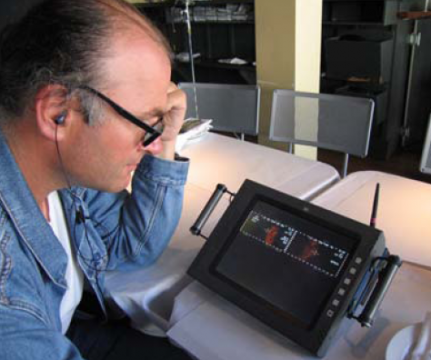 Oliver Cukor viewing two wireless cameras on the 10.4" TRANSVIDEO monitor through the wireless Quad system. 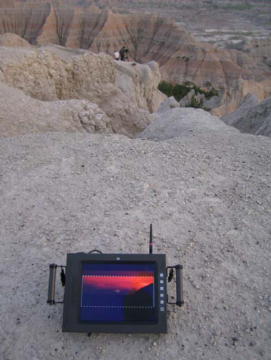 South Dakota Badlands: As the magic hour fades Oliver Cukor watches the shot wirelessly on his 10.4" TRANSVIDEO monitor from a few hundred yards away. 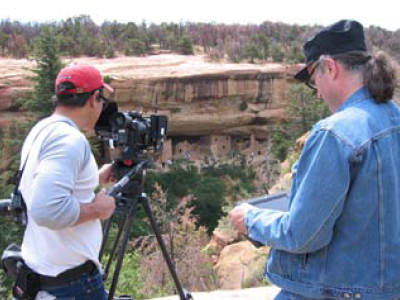 From the Anasazi Indian Cliff Dwellings of Mesa Verde to Los Angeles Olivera street and Clearwater river banks Idaho, the crew shot with 3 wireless cameras through 8 States in 68 locations for the 5-week schedule.